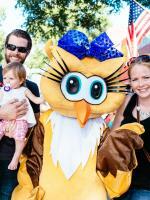 While Milledgeville offers attractions, events and activities all year, fall is prime time. One doesn&apos;t have to retreat to the North Georgia Mountains to enjoy autumn. Our farmers markets continue to offer seasonal produce, fresh baked bread and other handmade items throughout the fall. Lake Sinclair may cool down too much for a cannon ball, but we know it sure makes the fishing happier. Plus, strolling between our year-round museums is that much more enjoyable in the humidity-free air of Fall. So come visit Milledgeville this fall, eat like a local, catch a fish, explore Sherman&apos;s march and visit one of our MUST DO&apos;S.
1. Oconee River Greenway. Nothing says fall like the leaves changing and a cool breeze on your cheeks. Strolling in the Greenway provides the best views of the Oconee River, complete with colorful leaves floating by and a fog rising from the waters. It is picturesque. And let&apos;s not forget to mention the lack of summer heat allows that jog to be a little more pleasurable. The Greenway is complete with a river loop and a brickwork loop, including boardwalks, paved paths and trails. You can easily burn those calories while completely distracted by the natural beauty. On the second Saturday of each month, Buffington&apos;s hosts a free concert series. So pack a cooler, grab your running or dancing shoes and come down to the river. 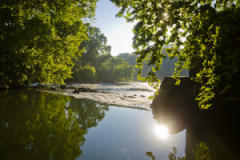 For more information, visit http://www.oconeerivergreenway.org/. 2. Haunted Trolley Tour. Let the Haunting Begin... 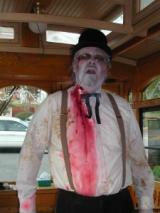 The Haunted Trolley Tour is back again with even more ghosts and tall tales. On October 26th-29th the tour will be haunting the residents of Milledgeville. This year&apos;s event will continue the nightly two show times in order to bring the public additional "adults only" tours later in the evening. Tour tickets are $15 for adults and $10 for children (under 16) and are first come, first serve. Tickets available at the CVB only beginning on October 1. Come and take the opportunity to tour Historic Milledgeville and experience the tales and characters that continue to haunt this town to this very day... For more information and ticket purchase, please contact the Milledgeville Convention and Visitor Bureau at (478)452-4687. 3. Deep Roots Festival. Typically known for the musical line-up and the ability to enjoy an adult beverage in the street, the Deep Roots Festival brings countless family-friendly activities. Over 100 vendors will sell handmade arts & crafts and the festival is the official host for the Georgia Barbecue Association State Championship. Old Capital Car Club will showcase the best in all motorized transport and the kidzone is complete with the best collection of rides and inflatables. 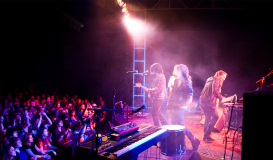 This year&apos;s music main stage will once again have you dancing all night with performances including Stokeswood, Bronze Radio Return, Ethan Tucker and Dale Earnhart Jr. Jr. On Saturday, October 24 downtown Milledgeville is where you must be scene. Visit their website for all the information, http://www.deeprootsfestival.com/. 4. Bluegrass at Andalusia. On October 10 grab your stomping shoes and dance partner for the 11th Annual Bluegrass Festival. From 3 - 8 p.m. the majestic oak and pecan trees at Andalusia Farm are a wonderful canopy for your lawn chairs, blankets, and picnics for several hours of the best Bluegrass music to be heard anywhere. Bluegrass at Andalusia is an event for the whole family; tickets are $10, students & seniors are $5, 12 & under are free. Nature walks and Porch Pickin will take place from 3-5. Good Country People takes the stage from 5-6. Heart Pine will play 6-7, and Packway Handle plays 7-8 p.m. For more information, visit http://andalusiafarm.org/bluegrass-festival/. 5. Blackbird Coffee. Who doesn&apos;t love the flavors of fall in their coffee? It speaks to the heart. 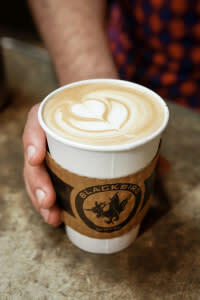 Blackbird Coffee located in the heart of downtown will fill your bones with warmth. Each barista is considered a "coffee-roaster" as well, meaning the baristas roast and create the coffee beans, and the coffee is produced in store. If you&apos;re lucky enough to be strolling downtown while the roasting process is occurring, you will experience the pleasant aroma of fresh roasted coffee all throughout Main Street. With favorites such as the "Honey-Nut Soy," the "Vanilla Caramel," and the "Coca Mocha Nut," Blackbird is the place for fresh coffee or a specialty drink - and we cannot wait to find out what pumpkin or cinnamon deliciousness they come up with this fall. Visit their facebook page for fresh information, https://www.facebook.com/pages/Blackbird-Coffee/41468422626?fref=ts.